There is a three week journey able to make us younger, healthier, more durable, more joyful. Franco Berrino, noted physician and studied it expert in nutrition, with Daniel Lau, an international benchmark in the practice of meditation, and David Mackay, trainer specialized in reactivation of the sedentary. Is a daily fact of recipes and practical path, physical and spiritual exercises. But also of knowledge, enlightenment, consciousness. If it comes out renewed in body and spirit. Three weeks, according to scientific studies and ancient wisdoms, are the time needed to take a habit, changing lifestyle. And ensure a healthy longevity. ? ?Get healthy in old age is not, for the most part, a fortune dictated by chance, but a chance for everyone, which is built on the daily choices and experience of life dictated by consciousness. Maintain health is a choice of Justice: we have no right to make our diseases onto others, removing years of life and happiness to our children by forcing them to take care of our disability or dementia. In this book we find the directions to allow our bodies to develop the maximum capacity for self-care, and learn to restore the lost balance when necessary. We will promote the recovery of the vitality, take a trip to physiological and mental balance and harmony that can bring change grandiose in everyday life.?? Promozione Il libro "Ventuno giorni per rinascere. Il percorso che ringiovanisce corpo e mente" su Unilibro.it è nell'offerta di libri scontati Scopri tutte le novità appena arrivate #inLibreria! 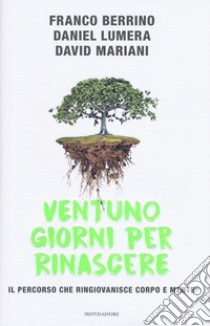 Recensioni Scrivi la tua recensione del libro "Ventuno giorni per rinascere. Il percorso che ringiovanisce corpo e mente"